Bensimon Byrne collaborated with Mill+ on Kim Crawford Wines 'Elevate' promoting the line of wines titled Undo Ordinary. The Mill+ team created a completely CG zoetrope. Originally this classic device was built by placing small figurines in slightly different positions in a circle. The contraption was spun quickly as a strobe light hit it, creating the illusion of a moving image. 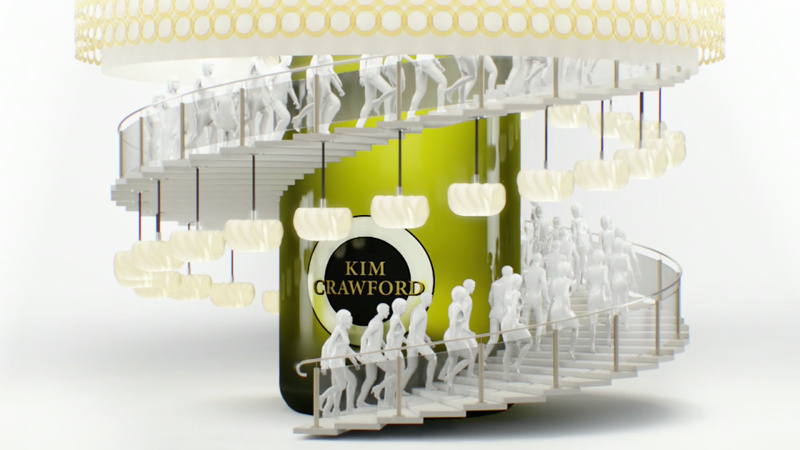 The CG team built the zoetrope surrounding a large Kim Crawford wine bottle. The design team decided to create 24 versions of different elements on the zoetrope to match the 24 frames per second rotation, including flowers opening and a tiny ceramic crowd talking and drinking. Since there needed to be a slight stop motion quality to the film, the artists animated a movement every two frames to imitate the vintage style. The ad reveals the core theme of 'Undo Ordinary', unleashing possibilities with style, elegance, and absolute originality.